Maxam KT17 17-Piece 9-Element Surgical-Stainless-Steel Waterless Cookware Set ensures that your cooking is done in the most hygienic, consistent and cost-effective manner. The cookware set is constructed of the highest quality surgical steel to provide quality, durable yet affordable catering service. 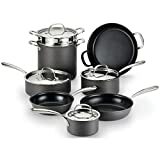 This 17-piece cooking set celebrates a non-reactive property with food materials making it professionally recommendable for wide-range cooking. The cookware set surfaces are able to remain sparkling clean for a very long period of time maintaining a new look always. The Maxam KT17 17-Piece 9-Element Surgical-Stainless-Steel Water less Cookware set has steam control knobs to preserve vitamins whenever you are cooking. 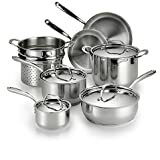 The Maxam KT17 17-Piece 9-Element Surgical-Stainless-Steel Water less Cookware set includes the following; one 7-quart covered saucepan; three 2-quart covered saucepan; two 5 quart covered saucepan; seven 5-quart covered roaster and one 11-3/8th skillet with a double boiler. Cooking can be a joyful experience when you have the right set that provides first class results. The cookware gives the opportunity to prepare healthy foods because you do not necessarily have to use cooking oil. You can use the steam control valves to prepare water less foods perfectly. As compared to other traditional sets, the steam controlled cookware enables you to boil your vegetables or cook your meals using no water or oil for a healthier diet. Stainless steel is a durable material that is common in most kitchen appliances. It has an appealing appearance and is easy to clean. This material is resistant to oxidation and corrosion making the cookware set not able to rust even after being used for a long period of time. This enables even and quick distribution of heat. It does not matter what the menu calls for; you can get ready and prepare your favorite dishes using this set for best results. The base has a thick aluminum disc for effective heat distribution and conduction. The handle is made from a special material that is resistant to heat, detergents and cold. It is aesthetically designed to have an appealing look and provides a good grip. The set comes with a life time guarantee and lasts long. Q: What is the meaning of 304 surgical-stainless steel? Ans: The 304 surgical-stainless steel contains 18% chromium and a higher percentage of nickel than the normal stainless steel. This makes it to have a gleaming appearance which lasts for a long period of time. Q: How can I keep the inside and outside pots shinning? Ans: You can get them shine by using a scotch sponge with a regular washing liquid. Q: Are the pans sticky or non-sticky? Ans: The answer can either be yes/no depending on how you use them. If you want them non-sticky, it is important to heat them up before you put your food. If you put your food when they are not hot enough, the food will definitely stick. Get this cookware for high cooking consistency and durable service in the kitchen. The Waterless Cookware Set does an amazing job on your cooking even in less heat. The steam system cooks perfect food and retains vitamins and nutrients. Having this cookware set makes creative and innovative cooking easy. You can work on any recipe since this Maxam KT17 17-Piece 9-Element Surgical-Stainless-Steel Waterless Cookware set has everything needed for the job.